Narcotic analgesics can also affect ED. Back surgery can affect ED symptoms. Exercise helps alleviate symptoms; alcohol makes symptoms worse. Sometimes ED can be a wake-up call for a lifestyle change. Alcohol makes ED symptoms worse. Along with poor fitness and lack of exercise. Men on ED drugs sometimes are more apt to get sexually transmitted diseases due to promiscuity and recreational use. Diabetes and hypertension are the main factors with ED. There is no perfect medicine; patient may have diabetes that can be an indication of ED. Normal aging does affect men; i.e. the 25 year old athlete is not the same as a 50 year old athlete. ED can be managed by altering behavior, and not just drugs. Dr. Carmen of Georgia Urology will be speaking about "The Story behind ED" this week. He is a graduate of Southern University. He received his Medical Doctorate from Louisiana State University Medical School. He completed his Surgical Internship at Loyola University, and his Urology Residency at Northeastern Ohio University. Dr. Carmen also has specialized training in Robotic Surgery and InterStim Therapy. In addition to General Urology, Dr. Carmen’s interests and expertise include Erectile Dysfunction, Prostate Cancer, Urinary Incontinence, InterStim Therapy, and Kidney Stones. Dr. Carmen is a member of the American Urologic Association, National Medical Association, American Association of Clinical Urologists, and American College of Surgeons. 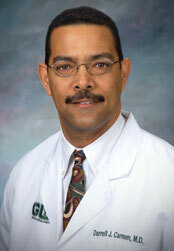 Dr. Carmen, a native of Baton Rouge, Louisiana, is married, has two children and enjoys swimming.